That contact between the territory that constitutes the present-day Karnataka and the Harappan Civilization existed in earlier times can be ascertained from the fact that gold discovered in Harappa was found to be imported from mines Karnataka. Before coming under the sway of the Mauryan Empire, Karnataka formed part of the Nanda dynasty whose last ruler Dhana Nanda (referred to as Xandrames or Aggrammes in ancient Greek accounts) which was dethroned by Chandragupta Maurya, the founder of the Mauryan empire. Chandragupta Maurya breathed his last in Shravanbelgola in Hassan District around 298 BCE where he spent last days of his life as Jain ascetic. The edicts of Chandragupta Maurya’s grandson and greatest Mauryan emperor Asoka have been found in various places in Karnataka including Maski, Brahmagiri, Koppaii, Siddapura, Jatingarameshwara, Udegolam and Nittur. After the decline of the Mauryan rule the northern part of Karnataka passed into the hands of the Satavahanas who ruled for well-neigh four centuries. When the Satavahana period came to an end, the land came under the control of Pallava of Kanchi, which in turn was disintegrated into Kadamba Dynasty and Western Ganga Dynasty. Banavasi (in Uttara Kannada District) and Talakad (in Mysore district) were the capitals of the Kadambas and the Western Gangas respectively. The Halmidi inscription (dated 450 AD) and a copper coin belonging to fifth-century found at Banavasi suggest that Kannada language began to be used in administration. After the collapse of these kingdoms the land of Karnataka was ruled by Chalukyas of Badami, the Rashtrakutas and the Western Chalukyas. Known for their excellent work in the field of art and architecture, the Chalukyas of Badami are credited with bring the whole of Karnataka under a single rule. The wonderful monuments found at Badami, and Aihole and Pattadakal in the Bagalkot district are mute spectator of the glory of the Chalukyas of Badami. The first great ruler of the dynasty was Pulikeshin I (c. 543-66 A.D) who performed the ashwamedha (horse sacrifice) after vanquishing many rulers including those of the Kadamba dynasty. He made Vatapi (modern Badami in Bagalkot district) his capital. His grandson, Pulikeshin II (609-42) built a vast empire which extended from Narmada in the north to the Cauveri in the south. He is credited with checking the southern march of Harshvandhana of Kanauj. The contribution of the Rashtrakuta rulers to the Kannada language is immense. Amoghavarsha I, the greatest ruler of the Rashtrakuta dynasty authored Kavirajamarga (“The Royal Road of Poets”), one of the most famous literary composition in the Kannada language. Manyakheta (modern Malkhed in Gulbarga district) served as the capital of the Rashtrakutas. Under the rule of the Western Chalukyas, a unique style of architecture made its appearance. Coastal Karnataka came under the sway of Chola Empire in the 9th century. Inscriptions dated 890 AD refers to the contributions of Aditya I to the construction of the Ranganatha Temple at Srirangapatnam (now in Mandya district of Karnataka). 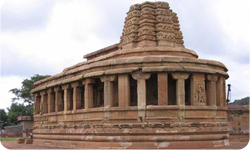 In the fourteen century, Hampi in Karnataka was the capital of the powerful Hindu Kiongdom of Vijayanagara. Though the city was mercilessly sacked by the marauding armies of the Muslim Sultanates of Deccan after their coalition defeated the de facto ruler of Vijayanagara, Ram Raja, in the famous battle of Talikota in 1556, the ruins of the city remain as a testimony to its past prosperity and the exceptional talent of the sculptors and artists. The splendor and affluence of Hampi, capital of the powerful Hindu Kingdom of Vijayanagara("City of Victory") on the Tungabhadra River, has been described in the accounts of European travellers who visited India during the period. Prominent among them are the Italian Nicolo dei Conti (15th century AD) and the Portuguese travelers Paes and Nuniz who visited India in the 16th century.